San Antonio FC has won their first ever match against MLS opposition as they managed a 2-0 win over Minnesota United FC in Florida on Sunday morning. San Antonio FC rebounded perfectly from their disappointing double header last week and will gain a full steam of confidence from the victory. There was a goal in each half as San Antonio FC managed a big preseason victory by upsetting the Loons in their final pre-season match. Defender Cyprian Hedrick scored his first goal for his new club while forward Devin Vega continued his stunning preseason with a second goal, forcing his way in to starting XI contention. The opening goal came right at the death of the first half as Minnesota gave away a free-kick right in range for San Antonio FC midfielder Rafael Castillo. Instead of going for the direct shot at goal Castillo opted to send in a cross to Hedrick, with the big defender using all of his strength and height to get a header away, beating the keeper and hitting the back of the net to give San Antonio FC a 1-0 half-time lead. The second goal came at the end of the second half as Vega was able to seal a famous win for San Antonio FC. New defender Ben Newnam was able to get a ball through for Vega to run on to, allowing him to slot home the winner. While the scoreline makes the match sound like San Antonio FC dominated the match, it was a tight affair throughout. Often times San Antonio FC had their goalkeeper Matt Cardone to thank for keeping them ahead as he pulled off a number of classy saves. As often happens in friendlies the second half saw the intensity drop due to the large number of substitutions. But soon enough San Antonio FC took charge of the second half and were able to find a second goal to win the match. It was a tight match at Comalander Stadium on Friday night as two of the bigger teams in San Antonio did battle. Lee managed a vital win for Lee, as they managed a 3-2 win over Churchill to boost their district title chances. It was a strong first half that put Lee in control of the match as they scored twice to take the match away from Churchill. Senior midfielder Ernesto Diaz was the player of the match as he was involved in two of the three goals. It was Diaz who opened the scoring as he was able to create space for himself and hit a powerful shot from outside the box. That shot was hit with enough power that it left the keeper with no chance to give the Volunteers the lead. Lee kept up the attack and despite strong defense from Churchill they were able to break through for a second late in the half. This time Diaz turned provider as he was able to layoff a ball for junior forward Samuel Gebremariam to run on to and bury the chance, which gave Lee a two goal lead at the break. Coming out trailing by two goals Churchill were determined to get back in to the match following a difficult first half. They came out attacking and scored the opening goal of the half as senior midfielder Anthony Carballo found space and got a powerful shot away to make it 2-1 and pull the Chargers back in it. But that was only short lived as Lee quickly restored their two goal lead through another great solo goal. This time it was from freshman forward who showed more experience than his age would suggest to score an impressive goal. Churchill gave themselves a chance late on after sophomore midfielder Dorian Eguez was able to send in a cross for senior forward Tristan Pettit to send home. But it came too late as Churchill couldn’t kick on and get the equalizer that they needed as Lee finished 3-2 winners. Gustaffson Stadium was the stage for a phenomenal girls varsity soccer match on Wednesday night as Clark and Brandeis did battle. It was a tight match between two strong sides with Brandeis eventually managing the 3-2 win. Yet again it was sophomore midfielder Marissa Arias proving the key player for the Broncos as she scored a brace. 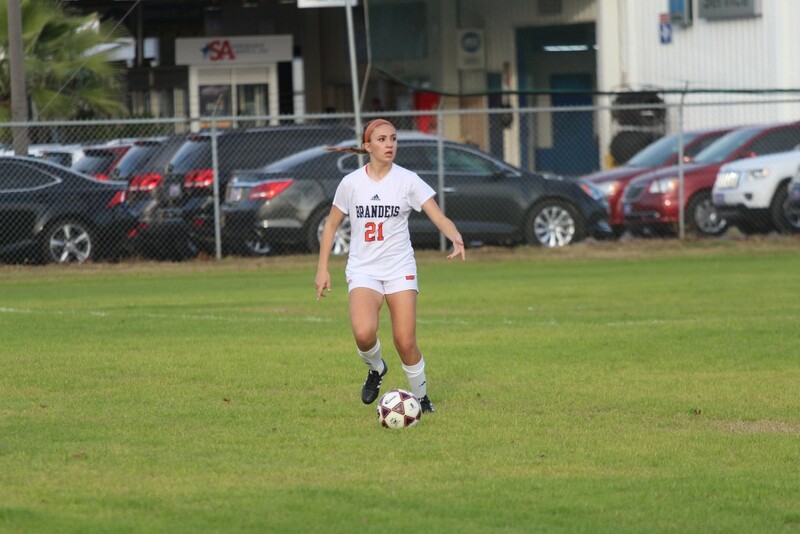 She continues to play as if she were an upperclassman and has been one of the strongest sophomores in San Antonio high school soccer, boys or girls. The match was tight throughout but Brandeis was just more clinical, having a higher shot conversion rate. Clark lead the shot count 9-8 but they could only convert two of those chances, with Brandeis managing to convert their chances. After a tight start to the match Brandeis opened the scoring and it was another one of their stars of the season involved in the goal. Junior midfielder Victoria Villasenor was able to send a ball in to the box for senior midfielder Diana Gasaway who buried the chance. That forced Brandeis to respond and they did so midway through the first half as junior midfielder Alex Garcia worked hard to create the opportunity. Garcia was able to get the ball in to the box for junior midfielder Alexandra Theriot to put the chance away. But Brandeis were back on top at half-time as they scored another strong goal to restore their lead, Arias scoring her first. The assist came again from Villasenor, continuing her good form throughout this season. Clark came out the stronger side in the opening stages of the half and they scored another equalizer early on. Freshman forward Ashlyn Theriot was able to cut the ball back to sophomore forward Jaeden Green who easily buried the chance. 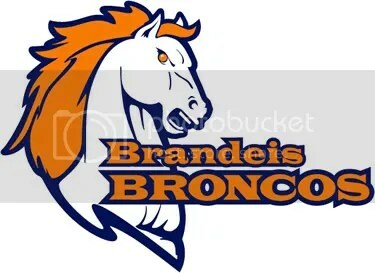 But Brandeis again hit back and took the lead, one that they would finally not relinquish as they sealed a 3-2 victory. Arias sealed her brace as she was able to get on the end of freshman midfielder Ashlyn Zingelmann’s cross to wrap up the win. San Antonio FC has added their third local player for the 2017 as midfielder Maxi Rodriguez signed on for the season, the club announced on Wednesday. Another player signed after a successful trial, Rodriguez will add depth to midfield and improves the local area connection in the playing roster. Rodriguez started preseason with the club hoping to land a contract to play, and did enough in the two matches he has played in so far. This contract with San Antonio FC marks Rodriguez’s first professional contract after a solid collegiate career. In 2011 Rodriguez won his conference player of the year award from his varsity senior season at Warren High School. While in High School Rodriguez also played for Classics Elite and was the captain of their USSF Development Academy team. He was likely previously noticed by San Antonio FC head coach Darren Powell due to his presence in North Carolina for collegiate soccer. Rodriguez played for UNC Charlotte winning the Conference USA regular season crown in 2013 and earning third-team All-Conference. Rodriguez was a four year starter with the 49ers managing 60 appearances, scoring twice and providing three assists while also appearing in the NCAA tournament three years. After signing Rodriguez the San Antonio FC squad is now looking at a healthy 23 members, with at least one more signing, a third goalkeeper, still pending. FC Dallas has signed their second round draft selection, Walker Hume to a Major League Soccer (MLS) contract on Tuesday. Hume joins FC Dallas after being drafted in the second round, 37th overall. The signing comes after Hume impressed in FC Dallas’ pre-season trip to Argentina last week, where he played 195 minutes. His most significant contribution to the team came in the match against River Plate Reserves on February 12th where he scored the match winner. Hume will be a signing that will please FC Dallas fans, being a local player, originally from the Dallas-Fort Worth area. Hume is a great advert for NCAA Division II soccer having started his collegiate career at Rollins College, scoring 12 goals and providing four assists. That saw him move to North Carolina where he scored eight goals and provided six assists. After missing the 2015 season, Hume took a redshirt and played his senior season in 2016 playing his part in North Carolina’s loss to Stanford at the national championship semi-finals. Hume is listed as a defender but often played a holding midfielder role while at North Carolina, and could well do the same in Frisco. Hume is the second member of his family to play professional sport in Dallas, with his maternal grandfather, Tom Franckhauser being a member of the inaugural Dallas Cowboys. He also already has a league championship under his belt, having been one of the younger members to win the Premier Development League title with Austin Aztex in 2013. 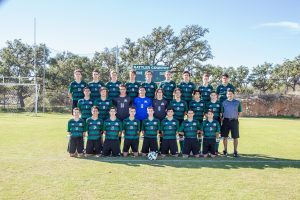 Two of the strongest teams in San Antonio boys’ varsity soccer were out at Gustaffson Stadium on Tuesday night as Reagan took on Roosevelt. It was Reagan who dominated the match and ran out 5-0 winners. After missing out due to suspension in their last match Justin Sukow returned, and did so phenomenally, starring for the Rattlers in the five goal win. Sukow was involved in three of the goals, scoring one himself and providing two assists. Sukow’s first credited assist may be a little generous as he was credited with an assist in the 20th minute. Typically his involvement of that goal shouldn’t be classed as an assist as it was a shot that beat the keeper but came off the crossbar allowing Shane Malone to finally score his first goal of the district season and open the scoring. From the kickoff Reagan stole possession and nearly had a second goal one minute later again through Sukow. The forward found space outside the box and hit a powerful shot which was again denied by the woodwork. They didn’t have to wait long, as the goal came three minutes later after some great team work doubled the lead. Carter Lovell was able to send in a cross for Sergio Gonzalez who scored easily, with the Rattlers increasing in confidence. The onslaught continued and five minutes later Reagan had their third goal of the match through another Sukow assist. Sukow sent in a ball which found Alejandro Gonzalez who buried the chance to make it 3-0 at the half. Just one minute in to the second half Reagan was able to further their lead and again Sukow popped up. This time he got the goal that he so deserved, after hitting the post twice earlier in the match. Sukow again found space and hit a powerful shot which left the goalkeeper with no chance and hit the back of the net. Trailing 4-0 Roosevelt started to come alive, and having chances, but the Reagan defense was up to the task. Ethan Belew, in goal for the second half, made four saves throughout the second 40 minutes as he kept Roosevelt out. The five goal win was wrapped up four minutes from time as Reagan scored yet another goal. This time Ben Evanson sent in a ball, finding Adrian Villagomez who finished the chance and gave Evanson yet another assist. The National Women’s Soccer League (NWSL) has announced the opening matches of the season with Houston Dash opening their season on April 15th. The Dash will play Chicago Fire at 2pm at BBVA Compass Stadium on that Saturday. That match forms part of the first ever Houston Dynamo/Dash double header, hence the earlier kick-off time of 2pm. It will be the second straight season that Houston Dash opens the season against Chicago Red Stars whom they defeated in the 2016 season opener 3-1. It is only nominally a double header as the Houston Dynamo organization has decided to hold each match as a completely separate match. That means fans wanting to go to both matches will need to purchase two tickets and will be forced to leave the stadium between the two matches, an odd decision from the management, that seems certain to lead to frustration and limit the exposure the Dash would have from being a true double header with the match against Minnesota United. Houston Dash is yet to lose a home opener, and will be coming in feeling like they can defeat Chicago Red Stars. They will be hoping for Carli Lloyd to return in form after her stint in England with Manchester City. After a disappointing 2016 season, Dash will be hoping to make the playoffs for the first time in club history. With that the Dash have made two significant additions from overseas with South African captain Janine Van Wyk and Brazilian Bruna Benites to strengthen their squad. The second match in the day will also give fans their first opportunity to see Minnesota United in Houston with United making their first Major League Soccer appearance in Texas. Houston hosted the regional qualification for the Generation Adidas Cup with the finals taking place on Monday at Houston Sports Park. FC Dallas finished as the winners of the region and so move on to the national finals later in the year. In the first match of the final day saw Toronto FC seal their place as the runners up in the region. It took penalties, with Toronto managing to save Houston’s last two penalties to seal second place. An own goal gave Toronto the opening goal in the first half, and that was seemingly enough until Heriberto Soto received a throw-in and shoot past the keeper to send the match to penalties. Sporting Kansas City needed a win to have any chance of nudging in to the national championship. They defeated Chicago Fire 1-0 as Sean Karani scored in the 27th minute with a shot off the post. Kansas City had to finish the match with 9 players when three players were sent off in the final 15 minutes, but Chicago could not take advantage. The final match of the day was the best of the tournament as FC Dallas won an eight goal thriller against Columbus Crew. FC Dallas managed a 5-3 win over the Crew to claim the region win and finish the regional qualifying undefeated. It was the first hast where most of the goals happened, with Colin Brios opening the scoring in the 15th minute as he headed past the keeper. That lead only lasted for two minutes as Adrian Morales caught out the keeper. It was 2-1 to the Crew in the 28th minute as Biros sent in a ball for a wide open Derik Broche. But again two minutes later Morales buried the chance to make it 2-2 before Jesus Ferreira made it 3-2 to Dallas at half-time. The second half was all FC Dallas, as they cruised to the win, and advance to the national finals taking place in April. There was a phenomenal match at Farris Stadium as Brandeis continued their impressive girls’ varsity soccer district form with a big win. 12 goals were scored in the match as Brandies managed a 9-3 win over Taft to secure their 10th win of the season. The first half was actually a tight match as the two sides fought for the control of the match early on. In the first half neither side really got control, but the Broncos really took over in the second half with two players, Marissa Arias and Mia Salas both scoring hat-tricks to win the match for the Broncos. Brandeis did manage to open the scoring with senior midfielder Diana Gasaway opening the scoring through with a nice finish. She was played through by junior midfielder Samantha Palomino which set up a nice finish. Taft were able to pull a goal back midway through the half with their main star senior midfielder Claire Zepeda getting them back on level terms. The assist came from junior midfielder Ashley Avila who set up Zepeda with a perfect ball. The final goal of the half came from Brandeis as the two players involved in the previous goal changed their roles. This time it was Palominio scoring the goal as Gasaway set her up for the finish, making it 2-1 at the half, with the match in the balance. But it did not take very long for Brandeis to take charge of the match with Gasaway managing another assist. Gasaway was able to turn and set up senior midfielder Ciera Fuentes who buried the chance. Following that goal the Broncos continued to attack and they got their two goal buffer shortly afterward. Junior midfielder Victoria Villasenor was able to set up sophomore midfielder Arias who scored her first goal and Brandeis’ fourth. The two main goal scorers for the second half worked on their own to score the next two goals pushing the score out to 6-1. Salas scored her first of the day before Arias sealed her brace to all but seal the match. Now five goals down Brandeis pushed and were able to score another goal as they tried to get back in to the match. Junior midfielder Ashley Epley was able to send a ball in to the box for freshman midfielder Adrianna Hutson to cut the gap to three. That goal was only a temporary stay as Salas scored again to make it 7-2, sealing her brace. That was then quickly followed by two goals to Arias and Salas wrapping up their hat-tricks before a consolation goal to Zepeda for the final score of 9-3. San Antonio FC’s preseason had a setback as they suffered their first preseason loss in a difficult day at Toyota Field. Playing St. Edward’s twice they failed to win either match with a scoreless draw followed by a 1-0 loss on Saturday. Fans should not panic, however, with the two squads being experimental, playing in a different formation. In addition, there were five trialists on the park for San Antonio FC at one point in the second match, with San Antonio FC head coach Darren Powell using preseason for what it is intended for. San Antonio FC made the bulk of the chances in the matches but they just could not connect and put any of them away against a determined St. Edwards’ defense. This may perhaps be due to the new formation with San Antonio playing a 4-1-4-1, a rare chance to see a lone striker, with Carlos Garcia and Kris Tyrpak given the difficult task in each match. The question remains if Powell will persist with that formation or move back to 4-3-3 which has proved more successful. After the two sides couldn’t score in the first three halves of the two matches five minutes in to the second half the goal finally came. A loose pass allowed St. Edwards’ possession, setting up a one-on-one chance against number two keeper Lee Johnson to give the Eddies the only goal of the day. San Antonio FC will continue their preseason preparations away from home next weekend as they head to Florida to take on Eastern Conference team Orlando City B and Major League Soccer team Minnesota United.